The painting portrays the family life that Thorvaldsen himself never knew. He never married, but quite soon after arriving in Italy he embarked on a relationship with the married Anna Maria Magnani. In 1806, after leaving her husband, she gave birth to Thorvaldsen’s son, Alberto, who died at the age of five, and in 1813 she gave birth to a daughter, Elisa. However, Thorvaldsen never lived together with the mother of his children, a woman with whom he had his serious ups and downs. In 1832, their daughter Elisa married the rather older Colonel Fritz Paulsen, an attendant to Princess Charlotte Frederikke, who was resident in Rome. 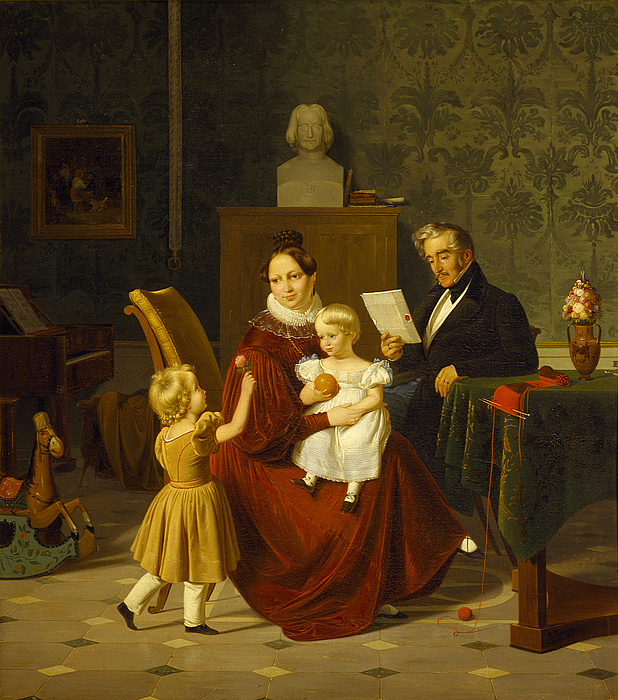 When he was preparing to return to Denmark, Thorvaldsen commissioned Küchler to paint a portrait of his daughter, son-in-law and the two grandchildren who had been born at that time. Together with her father’s bust standing on the cupboard in the background, Elisa occupies a natural position at the centre of the family portrait.